By Ed Runyan | December 9, 2018 at 12:09a.m. Trustee Matthew Vansuch says township residents were a bit shocked to learn that Howland officials have decided not to fight the annexation request they expect to get for the Enterprise Park development The Cafaro Co. is proposing north of its Eastwood Mall Complex. Township leaders have met with Mercy Health about the company having a five- or six-floor, $250 million, 350,000- square-foot St. Joseph Warren Hospital in the development, Vansuch said. They’ve also talked to Warren officials about the project and Mercy Health’s desire to remain in Warren, which would require annexation of the Howland property into the city. Mercy Health also has spoken with Warren officials about rezoning what would be needed at Enterprise Park. Vansuch said the township has not talked with any of the other entities proposed to locate in the development and does not know what their desires are for annexation. The application said the other facilities in the project would include a medical- office building of three to five floors, medical/educational center on three to four floors to be collaboratively developed and operated by Kent State University Trumbull Campus and Youngstown State University, an assisted-living and memory-care facility accommodating 90 to 110 residents by Youngstown’s EDM Management and a two-story general office building likely to accommodate additional medical, health care and/or educational entities and services. It also would include a midrise apartment building consisting of about 100 units on four to six floors to be developed by B&I Management Co. to accommodate health care and education professionals, a doctor’s office building of two to three floors for health care staff and physicians of St. Joseph Warren Hospital, and a building of two to three floors to accommodate the expansion requirements of the hospital. 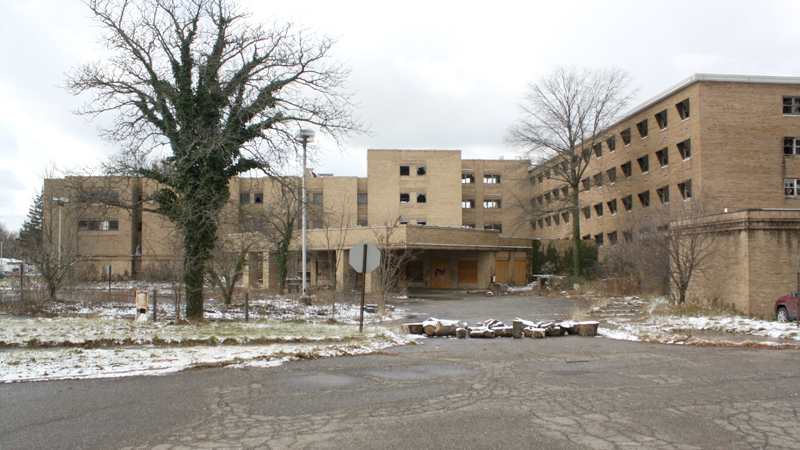 Warren already has one empty and vandalized hospital on its West Side: the former St. Joseph Riverside Hospital on Tod Avenue. The St. Joseph Riverside staff relocated to the former Warren General Hospital on Eastland Avenue in 1996. A corporation that first acquired the building filed for bankruptcy, and it has since changed hands a few times. Warren’s health department condemned it as unsafe in 2012, and the city has not succeeded in getting the site cleaned up. It is owned by Euro-American Finance Network Inc. of Leesburg, Fla., which owes $140,555 in back property taxes. Strollo Architects of Youngstown and Halsa Advisors had developed tentative plans for the Eastland site that would have included construction of a four-story addition, acquisition of adjacent properties to provide additional parking and driveway enhancements, addition of a new cardiac catheterization laboratory, a new main pedestrian entrance, moving the existing cardio-pulmonary and diagnostic area and ambulatory care center to a new location, renovation of the post-partum and post-surgical and gynecology rooms, more room for baby delivery, new 32-bed single-occupancy medical-surgical step-down unit above a new emergency department, construction of a bridge to connect a new building to the existing bed tower, operating room expansion, construction of another 32-bed single-occupancy unit and new intensive care unit. “It was estimated the renovation/expansion could cost ... 80 to 85 percent of the estimated cost to build a completely new structure,” the application says. That was one of the reasons Mercy Health decided against upgrading the current location, the application says. There were also questions about whether the hospital would have been able to acquire the property that would have been needed. The company Cushman & Wakefield then investigated 23 other sites, most of which encompassed 25 to 35 acres, the application says. One requirement for a site was it had to be in Warren or “annexable” to the city. It also had to have enough room to allow Akron Children’s Hospital to take up a “sizeable wing” there, be in a centralized location, close to amenities such as hotels, retailers and restaurants, entertainment, places of worship, banking and be easily accessible. Among the other top locations considered were the Warren-owned Old Avalon Golf Course on Warren Sharon Road in Howland, a 48-acre parcel on North River Road in Warren Township and a parcel on Parkman Road near Anderson Anthony Road in Champion Township. The Ohio EPA is reviewing the project’s water-quality application and comments from citizens at a recent public hearing. December 10, 2018 6:39 p.m.
How does current St. Joe’s fit into new plan? April 5, 2017 9:48 p.m.
December 18, 2018 10:55 p.m.